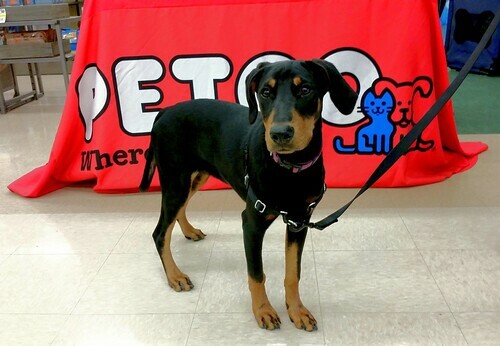 We started Basic Obedience a few weeks later and that's where Penny really got to shine. She loves to learn and work, and would get so excited when she realized it was "training night." 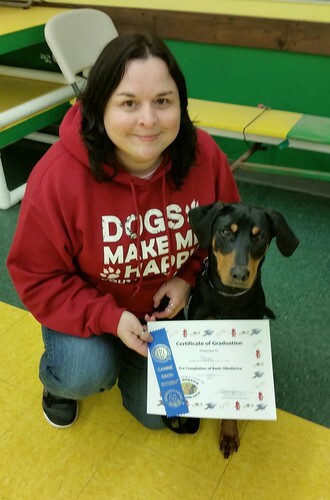 My girl graduated and passed the AKC Canine Good Citizen test just before Christmas. Yes, I am one proud Mama! We both had so much fun with our new friends from class. One of the biggest things I picked up (besides patience, lol) is to make training a part of your life every single day - short 10-15 minute sessions work best, especially when learning new commands - and I was happy to see that's one of the first things noted on the National Train Your Dog website. The NTYD website not only has a lot of great training tips and videos, but they also have a Dog Trainer Search Directory. However, our trainer was not listed, so keep in mind that not all amazing trainers are a part of this particular network. It's a good reference starting point, but as far as I'm concerned, word of mouth and personal recommendations are more important. Ask your friends, family and social network for recommendations. I put the question out on Facebook and within minutes I had several recommendations, and even a couple of "stay away from so-and-so because..." comments. The trainer I chose was recommended by at least half a dozen different people who have zero connection to one another - people who trained their own dogs there, groomers who's clients spoke highly of the facility, even relatives of dogs who took her classes. Contact your potential trainer and ask questions. My first contact was through email and trust me, I had lots of questions - all of which were answered in detail. If you have concerns about the style of training or equipment used in class, this is the time to ask. For instance, I knew of other facilities who used prong collars for training - something I wanted no part of. 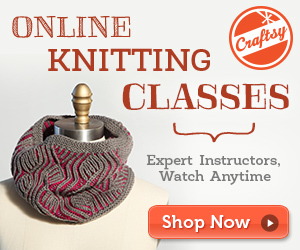 Upon asking, I learned that martingale collars were used in class, which was perfect as they are my preferred style. Be sure you understand the class description and know what it includes. Not all obedience classes are created equal - and that goes for length, commands taught, and end results. Penny's class was 12 weeks long and included some intermediate training, as well as the AKC CGC test on graduation night. Some facilities offer the CGC as a completely separate class. Visit the training facility before registering for class. When it comes to boarding, grooming, or training, I think this step is a must before making any reservations or payments. My trainer offered a visit, however, if the facility you're talking to fails to mention it, ask to set up a visit. Not only will it give you a first hand look at where you'll be spending the next 8 - 12 weeks, you'll hopefully meet the trainer in person and get in a trial run with your GPS if you aren't familiar with the area. In short, do a little research and ask a lot of questions. Any good training facility will be more than happy to spend the time with you. Well done Penny for passing your Canin Good Citizenship! Great job, Penny!! You are growing up so fast! Choosing the right training class is as important as choosing the right school for our human children! LOL! Some of our best training sessions are around meals, bedtime and parties. It's a good time to practice sit and down and stay. The best part is they don't even realize that they're having a lesson. I'm anxious to hear about your scentwork. I think Bailey would be good at it but I don't know enough about it. Of course Penny is a star student! Her intelligence comes through in your pictures, with her posing for the camera no matter what you do! Congrats on excellence in good citizenship, Penny! Congrats! Mr. N likes nosework. Have you thought about agility? There's also an online school that offers a ton of dog training classes (Fenzi). You are so smart to make sure she's well trained! I keep planning to work with a trainer, but it hasn't happened yet. 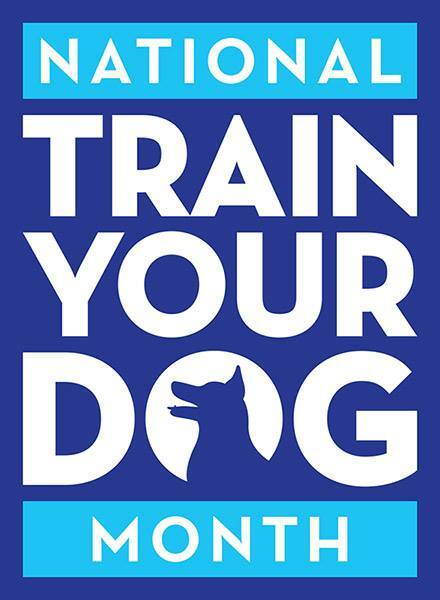 I had no idea it was train your dog month! Great post. I think the best trainers never have to advertise. They get all their clients through referral in my experience. We have train your dog month all year round here...lol...although winter is a little slower than the rest of the year. Congrats on the CGC. Bravo, Penny! And great tips on finding a trainer. Wow! That's quite the loot bag to go with your certificate. Congratulations! Henry thrives on learning new things. As it's Pet Training month we will have to research some new things to work on. Good deal with the training! You brought back memories. Lucy took two semesters of dog school, as I say. Given that she was my first dog ever, I learned a huge deal! She did too. The worst was a sit-stay in front of a door. As soon as I'd open the door she'd get up and bolt through. Now she does that perfectly every week at the dog park. After I take off her leash, she sits and stays while I open the door and runs into the park only when I tell her "OK". 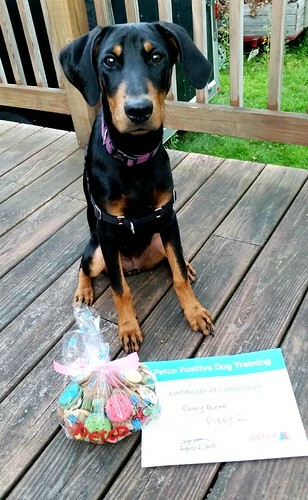 PepiSmartDog: congratulations to Penny for getting her first certificate. She looks a natural!